This architect designed barn conversion has been renovated to the highest standards. Beautifully restored throughout, the house combines old and new perfectly, with stone walls, high ceilings with beams sitting alongside the contemporary furniture and stylish kitchen and bathrooms. From both bedrooms, French doors lead out onto a private courtyard. From the lounge, a large farmhouse door leads out to a covered relaxing area and sun terrace with private swimming pool. There is a distant sea view. The first floor offers an open plan living and dining area with a built in kitchen. On the ground floor are 2 bedrooms (one with a King size bed and 2 bunk beds, the other with 2 single beds), a living room with a foldout couched and a bathroom with a bathtub. The property is located in a small village surrounded by olive groves and vineyards approx. 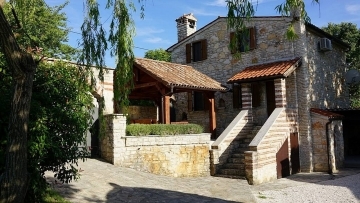 12 km from the sea and 5 minutes from the Groznjan, 15 minutes from Motovun.